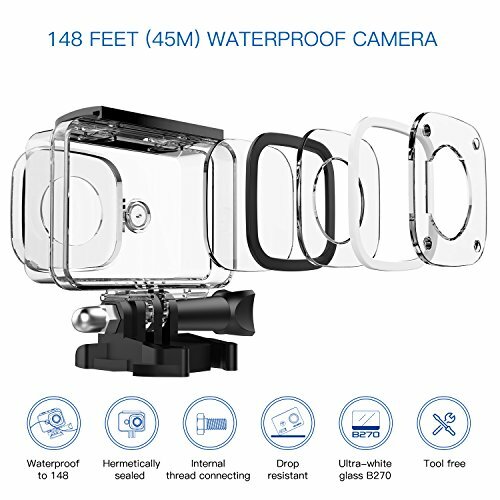 4K Ultra HD Action Cam- Panasonic sensor, 7 layers of glass lenses, records 4K/25fps, 1080P/60fps and 14MP photos using a 170 degree wide angle lens, your TEC.BEAN 4K action camera presents you splendid footages and pictures..
2 inch LCD Display. Real time review on the 2 inch LCD screen is super terrific. Take pictures of your desired one and record the exact moments. Loop recording, micro SD card supported maximum up to 32GB, HDMI output. Playback the videos and photos on your sports camera and delete undesired ones. 2.4G Wireless Wrist Remote Control Sports Camera. When you are cycling, gliding, zip-lining or skateboarding, shooting your photos or videos is easy. Press buttons on the remote. No more trouble - Mount the camera with the included accessories to any position, and catch your movement with the remote. WiFi & APP Control . Compatible With IOS Devices and Android Devices. Scan the QR Code On The Manual And Download The"iSmart Pro"APP. Easily Control The Camera And Manage The Photos & Videos On Your Phone. Save And Share Those Moments Anytime Anywhere.WiFi signal ranges up to 20 meters.